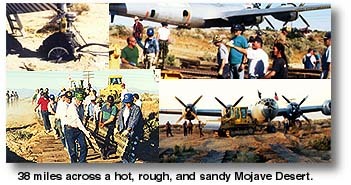 In 1987, an army of volunteers led by Tony Mazzolini and backed by the United States Aviation Museum mobilized their forces for a incredible mission -- recovering a World War II B-29 Superfortress Bomber and restoring it to flying condition. 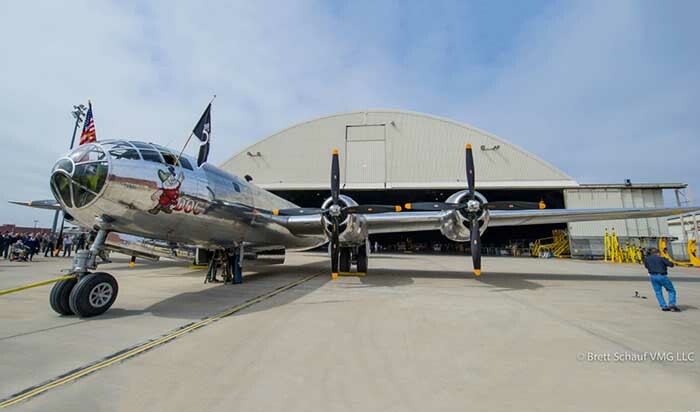 The aircraft was the last remaining B-29 available for restoration. 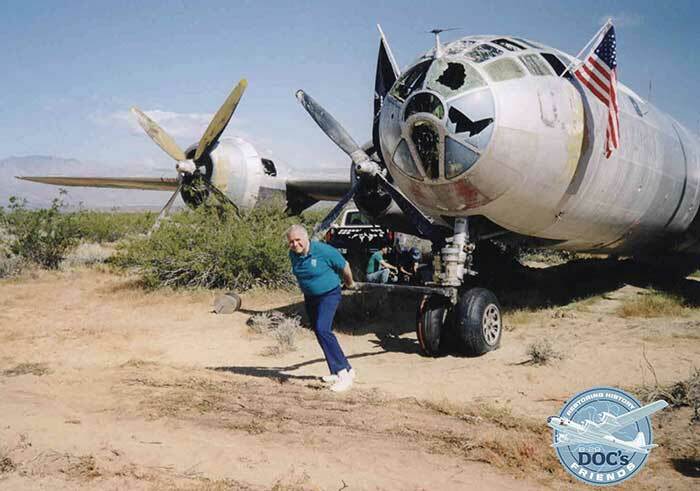 This B-29 had spent 42 years exposed to the elements of the desert on China Lake's electronic warfare range. It had survived intact, unlike its sister ships, which were used for ballistic missile drone and ground targets. Those B-29s were reduced to little more than scrap metal by bombs, bullets and shrapnel. This B-29 Superfortress had a wing span of 141.3 feet, was 99 feet long and weighed 90,000 pounds. What really made this aircraft such a prize was that the airframe and wings were in excellent condition, and it still had all four engines; rare, low time, R-3350-57 Wright Cyclone aircraft engine, 2200 horse power each. The logo of the Dodge Ram was on the front of the engines, which were manufactured at the Chrysler Corporation, Dodge Engine Plant in Detroit, Michigan in 1944. Manufactured by Boeing Aircraft at Wichita, Kansas and delivered to the United States Army Air Force in March 1945, the B-29 Superfortress 44-69972 was sent to Birmingham, Alabama for its first major modification. In May 1945, it was assigned to the Third Air Force. One year later, it was placed in storage at Peyote Army Air Force Base, Texas, where numerous B-29s were housed between WWII and 1950. The aircraft was pulled out and readied for action in the Korean War. It was modified for Radar Calibration and flew Radar Defense Evaluation Flights on the East Coast of the United States from July 1951 until February 1955. 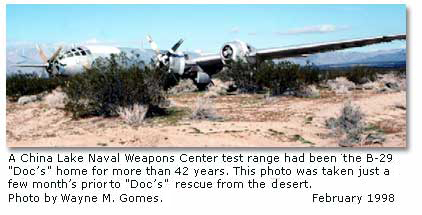 Later, the 17th Tow Target Squadron received the B-29 and converted it to a Tow Target aircraft for the Air Defense Command, Yuma County Air Force Base, Arizona. For its final mission, B-29 Superfortress 44-69972 was transferred from the United States Air Force to the United States Naval Weapons Center, China Lake Naval Air Station, Ridgecrest, California, 14 March 1956, to be used as a ballistic missile target for air combat training. On 19 March 1998, the Office of the Chief of the Navy, Secretary of the Navy, and Director of Naval History (NO8BH) (approved) under public law 10 U5C2572 the transfer of aircraft B-29 Superfortress s/n 44-69972 to Mr. Anthony I. Mazzolini, South Euclid, Ohio. Mazzolini had seen the plane in the Mojave in 1987; he had been waiting eleven years for this day and the final release of the B-29 Superfortress Bomber. In 2000, the B-29 made its way to Wichita for restoration. Volunteers in Wichita, Kansas have now brought the massive airplane close to completion and are getting ready to return the bomber to the skies. The non-profit volunteer organization Doc's Friends is raising money for a permanent museum to provide protection and a place to display the historical beauty to the public. Doc's Friends was founded in early 2013 with a vision to see the historic Boeing B-29 Superfortress restored as a flying museum. Doc’s Friends started the historic warbird’s engines for the first time Friday, Sept. 18. 2015, all went well. Video of starting engines 37 min. The engine start and testing is one of the final steps needed before the first flight after its amazing journey from relic to restoration. Jul 18, 2016 For the first time since 1956, the B-29 known as Doc took to the sky on a sunny morning in Wichita, Kansas. This video below includes highlights from footage captured during first flight. Pictures provided by The United States Aviation Museum.